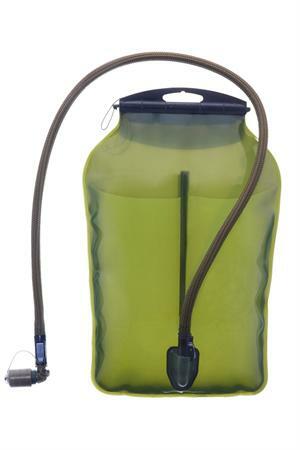 Dirt-Shield™ Protective Cover keeps the drinking valve free of dirt and protected. QMT™ Additional In line QMTTM Quick Connector at the tube extremity, allows connection of filter, UTATM or other accessories with the push of a button. Widepac™ Wide Opening Access Patented slide closure for easy draining and cleaning. Airtight seal. TASTE-FREETM System Co-extruded PE film retains pure liquid taste with no plastic flavor. BPA and phthalate free. Grunge-Guard™ Technology Inhibits bacteria growth on reservoir and drinking tube surfaces for the life of the system. Technology utilized FDA-approved and EPA-registered anti-microbial agent. Easy Care & Low Maintenance For use with water, clean by simply rinsing the system and hanging it opened until dry. For use with energy drinks or sweetened liquids, follow the cleaning instructions in the attached care and maintenance booklet.